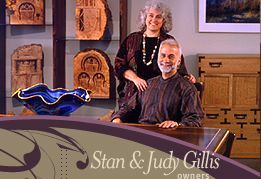 The application for the 2009 Buyers Market of American Craft is now officially up and running on zapplication.org. Due to a delay on both ends, the Buyers Market application for 2009 should be available on Zapplication by Wednesday. Prospective exhibitors can also download a prospectus and application from our website. Or email me, and I'll send you a PDF. First review will take place on September 1, 2008. Looking to add to your gallery mailing list? Check out the winners of this year's NICHE Top Retailer Awards, announced on August 3 at the Philadelphia Buyers Market of American Craft. 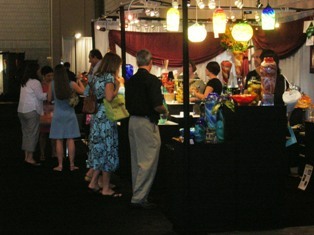 Philadelphia, PA. (August 2, 2008) -- The Philadelphia Buyers Market of American Craft opened today with increased buyer attendance and strong sales reports from the exhibit floor. The show continues through 4 p.m. on Monday, August 4 at the Pennsylvania Convention Center in Philadelphia. "We've been steadily writing orders since the show opened this morning," said Mark Rosenbaum of Rosetree Glass Studio in New Orleans, La. The biannual Philadelphia Buyers Market of American Craft is the largest wholesale-only tradeshow of handcrafts made by American and Canadian artists. It attracts thousands of retail gift shops, museum stores and galleries that sell fine handcrafted jewelry, glass art, furniture, ceramics, art made from recycled goods and more. "New and returning exhibitors are indicating first-day sales that are higher than expected," says Show Director Christine Kloostra. "Traffic on the floor has been steady, and buyers report that they are ready to write orders for the upcoming holiday season." Buyers who did not register in advance for the show may still register on-site at the Pennsylvania Convention Center. More than 1500 companies pre-registered for the August show, an increase of 26% over 2008. For more information, call 800-432-7238, ext. 211 or visit www.americancraft.com.